Drunk driving is responsible for millions of deaths globally. Being aware of some facts can help you avoid being part of the problem. Here are some of the top facts you need to know. Drunk driving is a serious issue when you understand how big of a problem it is. According to the latest statistics from the CDC (Center for Disease Control & Prevention), 29% of all traffic accident-related deaths in the U.S. are caused by DUI. In regards to the prevalence, one person dies every 51 minutes in the U.S. because of drunk driving. From a financial standpoint, alcohol related accidents cost the U.S. economy over $44 billion every year. What’s more disheartening is; 16% of traffic deaths involving children aged 0 – 14 are alcohol related. In 2015 for instance, 209 children deaths involved alcohol-impaired drivers. In regards to arrests, over 1 million drivers are arrested every year in the U.S. for DUI offenses. It’s also worth noting that over 100 million U.S. drivers have admitted to operating a vehicle under the influence at least once in their lifetime. These statistics are shocking given the consequences of drunk driving. It gets worse when you discover drunk driving is a global problem with countries like South African and Canada in a worse state than the U.S. According to the latest Global Status Report on Road Safety, the percentage of alcohol-related road accidents in South African and Canada is 58% and 34% respectively. If you thought drunk driving was a small problem affecting one country, think again. The latest CDC statistics indicate that drunken driving risks are greatest among young people aged between 21 and 44 years. This age group accounts for 78% of all alcohol-related accidents that happened in 2015. Considering most drivers on our roads today are young, these drunk driving risk facts should keep you sober. The effects of alcohol on your body are measured according to your BAC or blood alcohol concentration. When you take two drinks, your BAC increases to about 0.02%. Some of the most common effects of this include; slight body warmth, some loss of judgment, relaxation and an altered mood. If you choose to drive when you have taken two drinks, you risk having divided attention or an inability to perform multiple asks at one time. You also risk having declined visual functions. For instance, you may begin experiencing problems tracking moving targets. In a nutshell, operating a vehicle becomes a challenge instantly the moment you finish two drinks. It becomes worse with time. After three drinks (0.05% BAC) for instance, you will experience some difficulty steering if you attempt to drive. Your coordination will also be impaired slightly as well as your ability to respond to road emergencies. After five drinks (0.1% BAC), your ability to brake appropriately as well as maintain lane position reduces significantly. Once your BAC reaches 0.15%, you have substantial impairments in auditory/visual information processing, vehicle control and attention to multiple driving tasks at once. When you look at blood alcohol facts in-depth in relation to driving, you put your life at risk immediately when you finish your first drink. Many countries including the U.S. have a no tolerance policy for DUI cases involving drivers under the age of 21. You can get hefty fines, lose your license and even land in jail for years if you are caught drunk driving and you are under 21 years old in the U.S. The consequences for drunk drivers falling outside this age bracket are also dire. Checkout the jail facts relating to drunk driving in-depth to understand why you should drive only when you are sober. It’s easy to avoid being part of the drunken driving menace. This alone should be enough to inspire you to stay sober whenever you plan on driving. It takes little measures to stop the serious consequences of DUI. For instance, you should plan for alternative transport ahead of time if you are planning on drinking alcohol away from home. You can select a designated driver or take a taxi home. Last but not least, never board a vehicle being driven by a person under the influence of alcohol. Drunk driving is an offense because of the effects of alcohol on the body. To drive safely, you need different parts of the body to control your vehicle. For instance, you need your hands to steer your car. You need your feet to accelerate and brake Your also need your eyes to see obstacles. Considering all these different parts of your body are controlled by your brain, you need your brain to be working perfectly when you are driving. Furthermore, driving involves constant changes in the environment which demand unmatched awareness, alertness and quick decision-making capabilities. The brain is behind all these functions, and the most important thing to note is; alcohol has an adverse effect on the brain. Here’s a more in-depth discussion on the impact of has on your driving skills. When you take alcohol, the first part of the body that gets affected is the brain, more so, the frontal lobe which is responsible for reasoning and judgment. Your judgment starts getting impaired when your blood alcohol level is at 0.05% and above. This simply means your ability to reason, think clearly, plan ahead as well as make sound decisions reduces as you continue to consume more. Considering you need to think clearly, reason and plan ahead to make sound judgments on the road. You need to concentrate to drive safely. When your blood alcohol level increases to 0.1-0.15%, it starts affecting your midbrain which is responsible for vision, muscle coordination, and speech. When you are unable to make sound judgments, and your vision and muscles aren’t working properly, it is impossible to concentrate on the many activities and functions required to drive safely. This explains why most drunk drivers focus on one action when driving although they need to concentrate on multiple things at once. In fact, most drunk driving accidents happen because drunk drivers have a short attention span. Once you stop concentrating on multiple things at once when driving, you increase your chances of getting into an accident. You also need to coordinate different parts of your body i.e. the eyes, hands, and legs to drive safely. Unfortunately, alcohol impairs muscle coordination as seen above and affects a person’s fine and gross motor skills. You will have a hard time performing simple tasks like putting your key into the ignition. Poor eye, hand and foot coordination impairs your reaction time greatly yet you need a quick reaction time to avoid driving risks. You need clear vision to drive safely. Alcohol consumption impairs a person’s ability to control eye movements and numerous studies have shown that it slows down eye muscle function. It also reduces peripheral vision which is someone’s ability to see/notice what is happening on the sides when looking straight. Peripheral vision is crucial when driving. You need to see/notice what is going on around you even when you are driving while looking straight ahead. You also compromise your ability to judge distance and depth when your vision is impaired. Alcohol affects the brain which is the single most important organ for safe driving. You need a properly working brain to have sound judgment while driving. You also need the brain to be able to concentrate and have proper hand, eye, and leg coordination. Your brain is also responsible for proper vision. Alcohol affects all parts of the brain responsible for controlling all these crucial functions. When you are drunk, simple functions like seeing, moving, and reasoning become difficult yet you need these functions to drive safely. Alcohol isn’t the only drug to blame for road accidents. This is precisely why our focus is broader. Other drugs, apart from alcohol, whether legal or illegal account for approximately 16% of all road crashes in the U.S. every year. 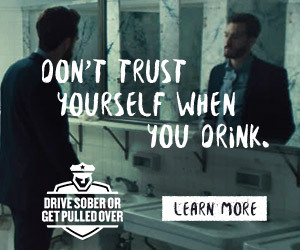 Drive Sober Illinois is an Illinois-based organization that focuses on creating awareness on impaired driving. We also offer support services to people affected by impaired driving. For years now, drivesoberillinois.org has focused on drunk drinking, driving under the influence of drugs as well as using gadgets while driving among other deeds that can distract drivers and cause accidents. © 2017 Drive Sober Illinois, All Rights Reserved.